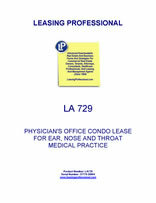 This lease is designed for the lease of an office condo for a medical practice use. The use of the premises must comply with the medical Code of Ethics, and the landlord reserves the right to terminate the lease if any of the practicing doctors has a license revocation. The use of the premises is subject to the provisions of the lease as well as the Condominium Declaration and rules and regulations. The medical tenant is responsible under the lease for its prorata share of operating costs for the building, and for fees and charges levied by the condo association.